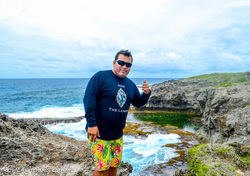 At Tropical Tours Guam we love what we do! Your 4-6 hour tour begins as you explore one of Guam's beautiful Waterfalls. Relax and cool off underneath the rainfall of the waterfall. Afterwards, we will take you to one of the best snorkeling locations on Guam. Where you will get to see dozens of tropical fish. Maybe even see a turtle, starfish, or barracuda. Transportation,Snorkeling/Safety Gear, and Lunch provided. Explore one of Guam’s majestic limestone caves. While exploring the cave you can swim in the crystal clear fresh water. We also take you to a beautiful cliffside view of the ocean. Afterwards we go to one of the best snorkeling locations on Guam and guarantee you will have dozens of colorful Tropical Fish swimming all around you. This 6 hour tour includes transportation, lunch, and snorkeling equipment, water shoes, and flash lights included. Spend half the day exploring Guam’s beautiful scenic overlooks, beaches, and historical sites. At a minimum, we will take you to Two Lovers Point, Latte Stone Park, Plaza De España, Asan Bay Overlook (War in the Pacific), Pacific War Museum, some Southern Routes to include Fort Soledad. This 6 hour Tour includes Transportation, entrance fees*, and Lunch. Explore the beauty Guam has to offer on a 2-3 hour Cave Exploring Tour. Spend your afternoon exploring our most popular lime stone cave where you can swim in the crystal clear fresh water. After exploring the Cave we take you to a beautiful cliffside view overlooking the ocean. Your 2-3 hour tour (3-6pm) includes transportation and equipment. (Water shoes, life vests, and snorkeling gear provided). Explore Guam’s beautiful marine life on a guided Snorkeling Tour. Your guide will take you to one of the best snorkeling locations on Guam. You will get to see dozens of tropical fish. Maybe even see a turtle, starfish, or barracuda. Transportation (round trip) and Gear (lifejackets, mask/snorkel, water shoes, and fins) included. Discover the culinary traditions on a 3-4 hour cooking lesson. Cook and eat with the locals (our family). Learn the preparation methods for popular Chamorro foods like Red Rice, Kelaguen, BBQ chicken, BBQ Ribs, to name a few. Offering you a newfound appreciation for our Island's cuisine and culture. Best of all, you get to eat what you cook. This small-group course includes a guide/cooking instructor. Want to book a tour for a friend or family member? Just book the tour and they can choose a date.